Truth: It’s hard to leave your best friend at home while you go to work. Saying goodbye each morning to those sad eyes can be the hardest part of the day. Thankfully, more and more companies (like us!) are pet-friendly. If you’re lucky enough to find yourself working for a company that lets your four-legged friend share your space, here are some office dog survival tips to help make life easier on you, your pooch and your coworkers. 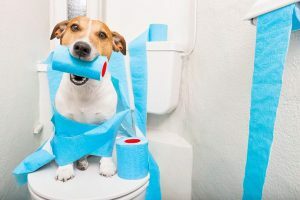 Being with you all day will make your dog’s tail wag with happiness, but there are several key items that will keep Fido healthy and comfortable. Create a cozy spot for your pup by bringing in a dog bed or fluffy blanket – even better if they smell like home. If they have a favorite toy, make sure to have it on hand along with poop bags and a pet safe disinfectant in case an accident does happen. Accessible food and water is a must, as well as any medication they may take during the day. Toys and bully sticks (tip: go for the odor-free ones!) are a great outlet for your dog to help pass the time while you work. For nervous dogs, plugging in a hormone releasing diffuser can calm them down and make them feel more at ease. Puzzle games are particularly fun for dogs and will keep their minds engaged all day. 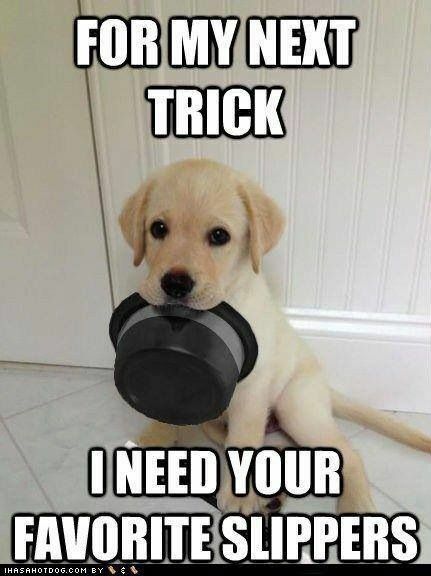 And don’t forget the treats! Can’t we all just get along? 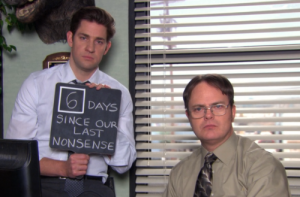 Unless you work in office Babylon, there’s a good chance that a few of your co-workers might rub you the wrong way – just like Jim & Dwight from The Office. The same can be said about dogs. Fluffy and Muffins may never be best friends, but if you introduce them properly, they may be able to tolerate each other. To help prevent doggy drama, it’s important that dogs meet in a neutral place so nobody gets territorial. The office parking lot or a nearby park are both good choices; take several minutes for them to check each other out, do a few sniff tests and become familiar with each other. Then, walk them back into the office together. 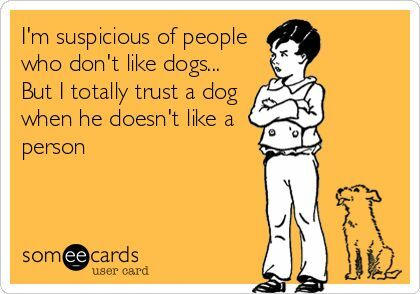 This can make a world of difference when it comes to keeping the puppy peace. 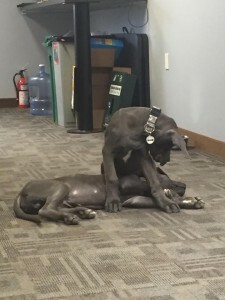 Things that seem boring to you at work can seem like a lot of fun to dogs! It’s a good idea to hide any electrical cords they might chew on, as well as secure any toxic materials that they could get into. Items like permanent markers, pesticides, office snacks, and poisonous plants are best kept away from your furry friend. 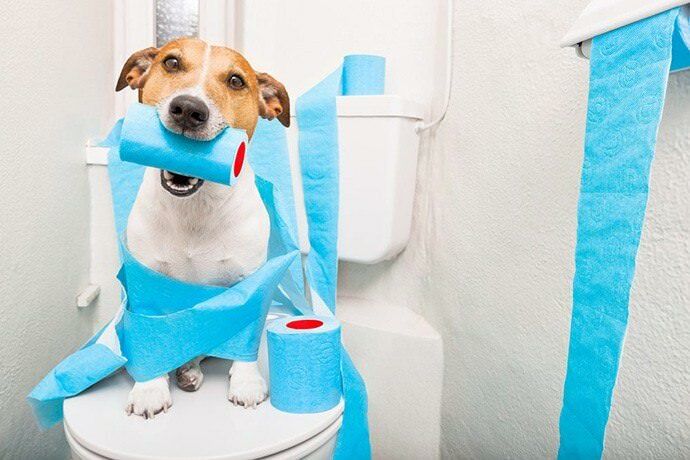 Just like there is no “I” in “Team,” there is no “Pee” in “Office, so it’s important to know your dog’s bathroom schedule. Make sure that your pup has enough opportunities to relieve himself outside rather than in Barb from accounting’s office. And of course, keep lots of poop bags on hand to clean up after a potty break. Office life agrees with some dogs, and stresses others out. You know your pooch best, so watch out for signs of agitation or stress at work. Additionally, if your dog is aggressive, excessively shy, or very excitable, the corporate world may not be right for him. Although you love your dog with a capital L, some of your coworkers may not feel the same way. Even if your pet-friendly office feels more like a zoo than not, it’s best to check and ask if anyone is allergic to dogs or doesn’t feel comfortable around them before bringing Spot in. There may be workarounds for these situations, and you’ll also know to keep him away from these particular colleagues. Be sure to follow us on Facebook, Pinterest, Twitter and Instagram for more pet-friendly tips and tricks! Puppy Proofing Your Home…and Office! 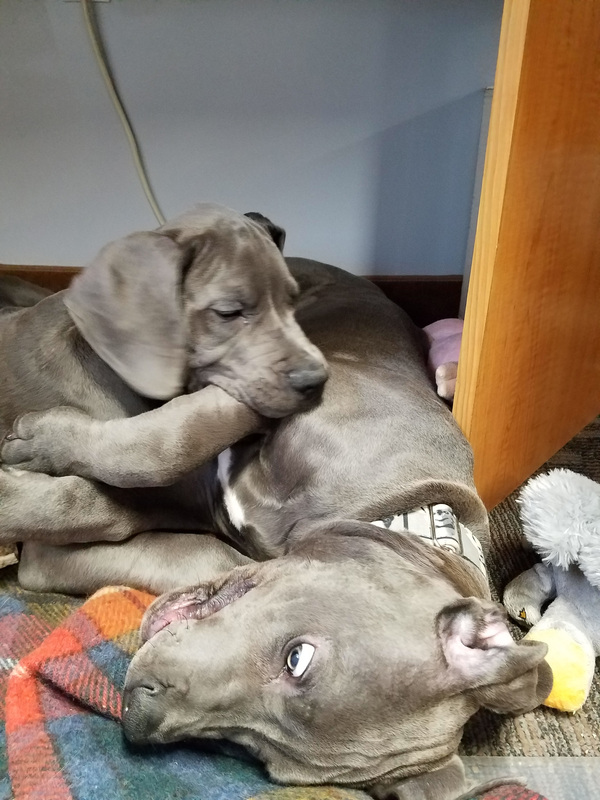 With two rambunctious Great Dane puppies (and litter mates!) recently welcomed into the Dog-ON-It family, we’ve been busy puppy proofing just about everything we can. Here are some tips to help make sure your pup is as safe as they can be when they’re not snoozing the day away. The Chew: Puppies, just like human children, go through teething…in addition to exploring the world around them with their mouths. We’ve found a few ways to help distract them from chewing on things they shouldn’t (like furniture or you)! Our blue Dane boys love elk antlers and bully sticks, and keeping them occupied with food dispensing puzzle toys is a fantastic way to direct their energy towards something positive. The Kong Wobbler is especially popular here and we use them to feed Otto & Gozer their lunch; they have to knock it over to dispense the kibble and the hard plastic makes it pretty chew proof as well. 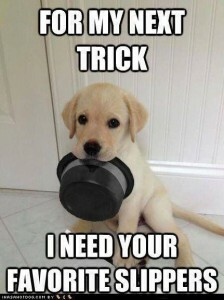 Another option is to stuff a standard Kong or other durable chew toy with treats, peanut butter, yogurt and/or anything else your puppy loves. Even better? Put it in the freezer for an hour or so for some relief for those puppy teeth and gums. Crates are Great: Ok, folks, this is a lifesaver. Dogs are den animals and love having a quiet space they can call their own. Make sure the crate isn’t so large that they could use part of it as their bathroom (crate dividers are helpful!) and also keep it stocked with a favorite blanket and some toys. But…most importantly, never use the crate as punishment. 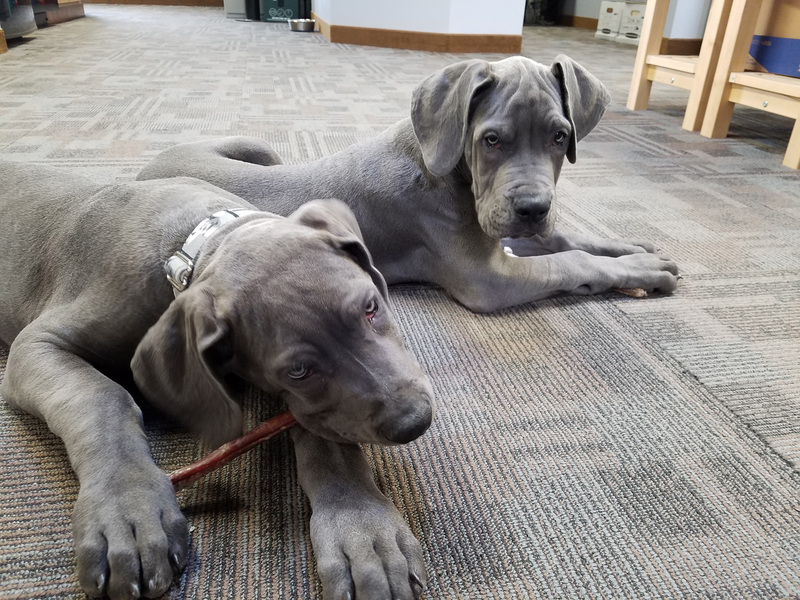 They should want to go in on their own and it always helps to use treats or positive reinforcement to reward that behavior. We especially like the light travel style crates for the office and the sturdier wire, collapsible ones for our home. Highway to the Danger (Free!) Zone: Puppies are notoriously curious and even with the best of intentions, can get themselves into a pickle. Whether it’s a particular food, something they’ve discovered in the yard, or anything that might not, ahem, pass, keep your eyes peeled for potential problems. Also, if Fido is smarter than the average bear, child-proofing cabinets in both your bathroom and kitchen where cleaning supplies are usually kept is not a bad idea. Chocolate, raw onions, anything with xylitol, cooked bones – particularly poultry, caffeine, grapes/raisins, alcohol and even though it’s legal now in some states…marijuana. Vet offices are seeing a huge increase in marijuana related visits, so please keep your stash “high” and out of reach! We like to supplement our puppies’ meals with some healthy people food too. Fresh veggies such as green beans, peas, shredded carrots are well received as are roasted root vegetables like sweet potatoes, turnips, and rutabagas. Eggs are popular too, along with limited amounts of cottage cheese and plain yogurt. X-Ray Vision: Well, we don’t really have x-ray vision, but we do keep a super close eye on the floor. Here at the office, things like random staples, paper clips, and tape can easily end up in a dog’s mouth. Making sure your floors are tidy is an easy way to prevent obstructions and digestive upset. Another big one – cords. Yep. Our pups love cords. And since you can’t really unplug everything, Bitter Apple Spray along with a firm “NO!” is a great deterrent. Remember to praise your pup when they drop or walk away from whatever you’ve asked them to! Hopefully some of these tips might help keep your puppy safe and you sane – woof! 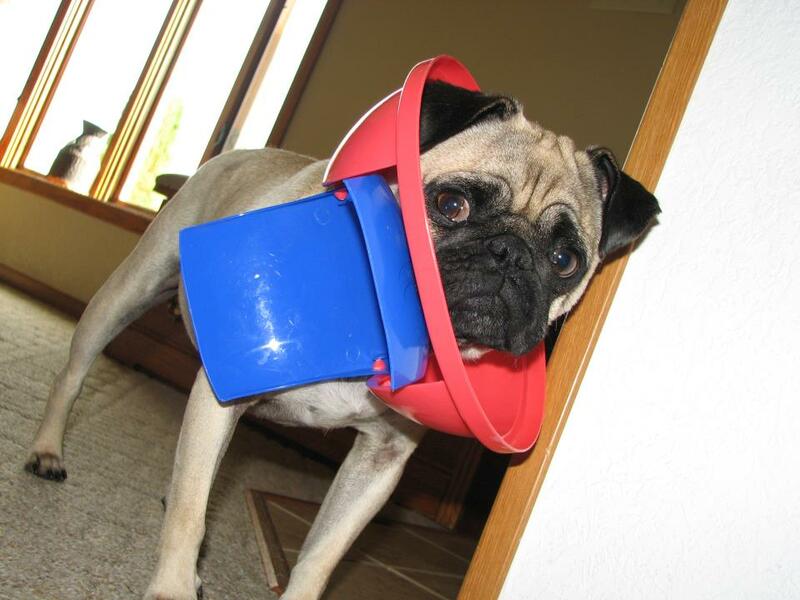 Posted in Uncategorized | Comments Off on Puppy Proofing Your Home…and Office! Meet Duchess, the newest addition to our office dog team! Duchess is a 12 week old lab mix and was adopted from a local animal rescue organization (we love to support dog rescues!). This little puppy is the sweetest girl who loves nothing more than being cuddled. Her favorite hobby is to grab her stuffed hippo and curl up in your lap while she plays with it. She has been experiencing a lot of firsts and encounters every new task bravely. Stairs seem to still pose a challenge for her (and her face with all of the falling she does!) but we are confident she will master them soon. Eating and playing with snow is also near the top of her list of favorites until she realized how cold it gets. 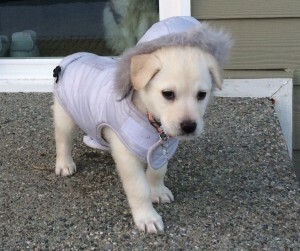 She wasn’t sure about her new snow vest at first, but quickly learned to love it once it warmed her up… and we love how cute she looks in it. She brings so much happiness to our office and has truly become part of the Dog-ON-It family! We are excited to watch her grow, experience the world and learn dog agility like our other office pups. Stay tuned next month to meet office dog Rory! Click here to access Dog-ON-It-Parks’ design files including cad drawings, specifications, videos and related documents. The CADdetails program is developed specifically for design professionals with the goal of getting manufacturer-specific product information into their working plans. © 2008-2019 Dog-ON-It-Parks. All Rights Reserved.